This product is available for collection only. In August 1847, Winfield Scott’s US Army was at the gates of Mexico City after a string of victories over Santa Anna. However, Scott paused to negotiate. 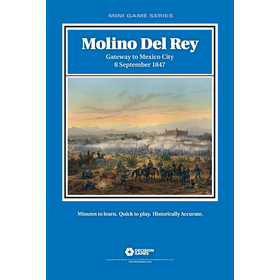 Both sides used the delay to regroup, but when Scott heard a rumor that the Mexicans were casting cannon at Molino del Rey, he resolved to take the place. The Mexicans saw it coming and prepared their defenses. The result was a narrow but costly American win that left the city's defences intact. A quicker victory might have pushed into the city and ended the war.